Protesting against the building of the new base in Henoko, the participants shouted "Ganbaro!" three times on the beach in Henoko on September 20(Photograph taken by Masatoshi Moromizato). 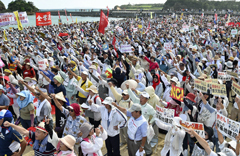 Citizen groups gathered on the beach in the Henoko district of Nago in Okinawa for a protest rally against the construction of a new offshore U.S. air base in Henoko to replace Marine Corps Air Station Futenma, on September 20. It was the second rally within a month. The first rally was held in front of Camp Schwab on August 23, attracting about 3,600 people. According to the organizer, about 5,500 people took part in the protest rally this time. Insisting they would not allow the U.S. and Japanese governments to build the new base, which they say threatens peace, the participants expressed their opposition against the plan to move the base inside Okinawa. The executive committee consists of the “All Okinawa United Forum,” Okinawa Peace Movement Center, and an organization of opposition lawmakers elected from Okinawa, four fractions of opposition parties in the Okinawa Prefectural Assembly, and the Prefectural United Coalition, Peaceful Citizen Liaison Council, and Residents Council Against the Helipad Construction. Representatives of each organization, Nago Mayor Susumu Inamine and Naha Mayor Takeshi Onaga, and a university student took the platform, asking the U.S. and Japanese governments to stop the construction. They have adopted a resolution to call for Okinawan people to continue to work towards stopping construction of the new base. According to the executive committee, 67 motor coaches full of protestors, arrived one after another in Henoko beach, after midday on September 20. Family members, community members and co-workers took part in the rally. They applauded the speakers. The executive committee plans to ask the prefectural government to reject an application filed by the Okinawa Defense Bureau requesting approval to modify the landfill method to be used for the construction of the air base in Henoko. They also plan to hold a protest rally surrounding the prefectural office building in the middle of October when the prefectural government will have completed reviewing the application.